Found on the streets of New York, located on the NYU campus, between 2nd and 3rd St. by the Barney Building, sits a hidden gem of street art. 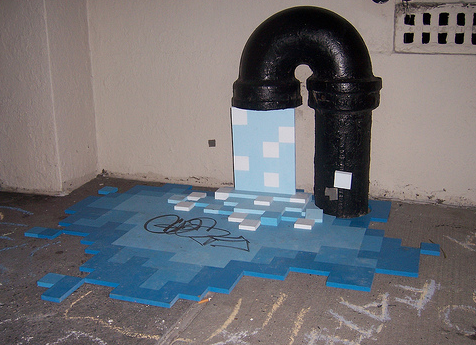 Captured and uploaded onto Flickr by user hungryghoast, the “Flowing Pixel” street sculpture depicts a faucet spitting out pixelated water. I favorited it the other day because I heart it. 8-bit LOVE! I usually use pixels in animatable-ways, but this seems to work out well, as well. @Kelly Goelier Congrats on the recognition. You deserve it! Awesome job.